2012 U.S. Olympic basketball team: The original Dream Team was great, but LeBron James and Kevin Durant played tougher competition. What’s the Difference Between the 1992 and 2012 Dream Teams? Kevin Durant and LeBron James Played Tougher Competition. 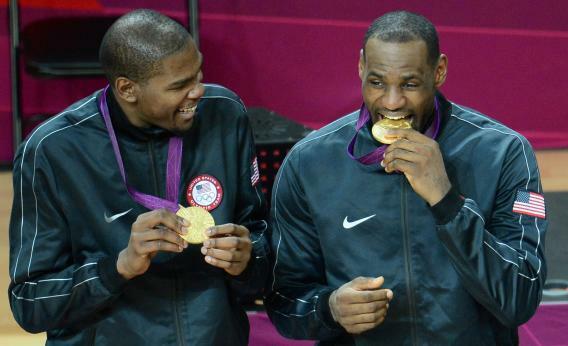 Kevin Durant and LeBron James pose with their gold medals after beating Spain at the London 2012 Olympic Games. It’s impossible to say who would win a game between the 1992 and 2012 U.S. Olympic basketball teams. You can’t compare teams across eras, anybody could win in a single game, etc., etc. But the most important factor to consider is that the original Dream Team only broke a sweat in split-squad scrimmages. Michael Jordan, Magic Johnson, Charles Barkley and the gang won by 43.8 points per game in the 1992 Olympics. In the gold-medal game, they won by 32 against a Croatian team with three players who had significant NBA careers: Drazen Petrovic, Toni Kukoc, and Dino Radja. Against Team USA, Croatia’s big three scored 63 points on 23 of 43 shooting. The sub-standard filler that made up the rest of the Croatian team netted just 22, a number that didn’t cut it against an American squad with seven players in double figures. This is the great myth about the Dream Team: Even they couldn’t totally outclass international players with NBA talent. The difference was, back then, most of the foreigners didn’t know how to play. In July 1992, the Washington Post’s Michael Wilbon wrote that only four Europeans had at that point made an impact on the NBA: Petrovic, Vlade Divac, Sarunas Marciulionis, and Detlef Schrempf. By contrast, the Spanish team that lost 107-100 in today’s gold-medal game has six players—Pau and Marc Gasol, Serge Ibaka, Rudy Fernandez, Jose Calderon, and Juan Carlos Navarro—who’ve played major NBA roles. And consider how much better Spain would’ve been if point guard Ricky Rubio hadn’t torn up his knee in March. Given the current state of international basketball, there’s no such thing as a close victory that’s worth agonizing over. On Sunday, the United States shot well enough to win by 30, making 49 percent of its shots from the floor and 41 percent from three. But just as in 2008, when the USA won by 11 in the gold-medal game, this Spanish team was good enough and savvy enough to keep the game close. The way the big-man-free American roster was constructed, they could only win big when they trapped and ran the floor. Spain wouldn’t allow that. When Chris Paul or Kevin Durant got the ball in the open court, some hirsute Spaniard would commit a tactical foul. Spain also turned the ball over just 11 times, got a bunch of threes from Navarro, and took advantage of its size down low, with the Gasols and Ibaka combining for 53 points. At the beginning of the fourth quarter, Spain had the lead down to one. But then the USA went on a 17-9 run, starting with five in a row for Paul. Then came a Durant three, two free throws and a jumper from Kobe Bryant, and a dunk and a long three from LeBron James to end all remaining suspense and kill off every LeChoke crack for eternity. That seven-and-a-half-minute display of shooting, driving, dunking, and defense was the best demonstration imaginable of America’s continued basketball dominance. The fact that the 2012 Olympics team needed to go on that run to win gold shows how much the game has grown in 20 years. Yes, the original Dream Team had 11 Hall of Famers, but the best team they played against was a bunch of college kids. We don’t know how much the 1992-ers would’ve been tested against today’s competition, but we do have a good sense of the current state of basketball in the United States. The world’s best still isn’t good enough, but it takes our best to prove it.